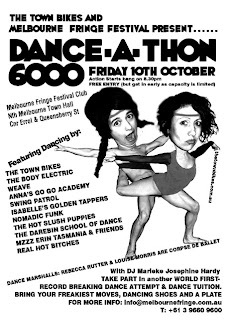 There were 52 of us from Anna's Go Go Academy dancing The Madison at Dance-a-thon 6000. An incredible mix of dance troupes - a veritable adult rock eisteddfod! Hosted by the ever wonderful Town Bikes. My favorite was the record breaking effort by the audience - 300 people rocking the ribbons, interpretive dancing to Fleetwood Mac. Enough said.